In the arid Santa Monica Mountains, between the gnarled branches of towering oak trees, lies an entrance to the realm where the virgin goddess Artemis has hidden for the last millennia. With only animals and her immortal handmaidens for company, she’s never quite able to conquer her boredom. That is, until the day werewolves come hunting in her woods. Alpha of the Los Angeles pack, Jackson Hunter, has come to the enchanted forest desperate to find a solution for a deadly problem—his packmates are being hunted and eaten by a mysterious monster that is impossible to track. Jackson is out of luck and nearly out of hope … until he accidentally challenges the immortal goddess by saying she’s not up to the task of hunting the beast. Tempted from her seclusion by the mortal’s challenge, Artemis goes with the alluring werewolf into a world now entirely unfamiliar to her. But the hunt is more dangerous than she could have imagined. And nothing is in more danger than her heart. I gave this book 4 stars. It was quick and steamy and I couldn’t get enough of it. I pretty much read this book in one sitting. I have now read 3 books by Rita Stradling and I’ve enjoyed every single one of them a lot. She has become one of my auto-read authors because she hasn’t disappointed me yet. One thing I’m a bit confused about is that it’s said to be the sixth book in the series, but I can’t seem to actually find the rest of the series. I’m not even sure if that was a mistake or if it’s one of those series’s where each installment is written by a different author. I’m really not sure about that. What I do know is that this book can definitely be read as a stand-alone. I feel like the bases of the romance was a bit wishy-washy considering it was about the VIRGIN goddess, Artemis. It’s kind of her whole thing that she would never lay with a man so I feel like that may have weakened her portrayal a bit. However, I can’t be too mad because I really really enjoyed said romance and Artemis was a fantastic character. Jackson is definitely a new book boyfriend. There are two things you should know about me: I love the name Jackson, and I love alpha male love interests. A lot of people hate cocky one interests and if this is the case for you, this probably isn’t the best book for you to read. However, I personally love it. 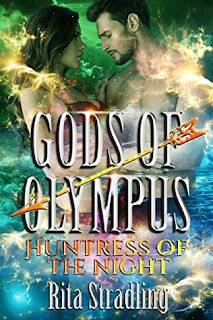 If you like romances and mythology, this would be a great little read for you.